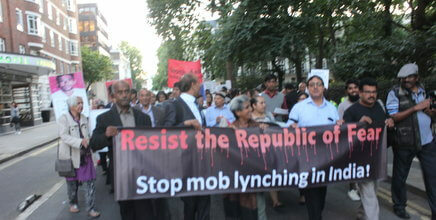 In a massive show of strength hundreds of Indians living in United Kingdom gathered at Tavistock Square to express their disapproval of the politics of hatred and growing incidents of mob lynching against minorities, Dalits and other marginalised sections in India. They expressed their horror how the constitutional values of secularism, pluralism, democracy and dissent are under the assault by the ruling Bharatiya Janata Party and other Sangh Parivar affiliates. There were different civil society and human rights organisations who participated in the march. They include South Asian Solidarity, Federation of Ambedkarite and Buddhist Organisations, Caste Watch, Voice of Dalit International, Anti Caste Discrimination Alliance, Dalit Solidarity Network and others. At the Tavistock square, Ms Amrit Wilson spoke of the growing threat to minorities, Dalits and others in India and why we need to disapprove the culture of mob violence. The marchers then marched silently nearly about two kilometers passing through Central London’s important streets and reached the India House, Indian High Commission. They shouted slogans at the India House against the mob lynching and Narendra Modi’s government’s absolute freedom to these goons in the name of cow protection. Speaking on the ocassion Mr Satpal Mumman, the Chair, Caste Watch UK, said that it is deeply disturbing to see how fascist forces are taking India to a dark age violating our constitutional principles of Equality, Liberty and Fraternity as enshrined in our constitution drafted by Baba Saheb Ambedkar. Ms Santosh Das, President, Federation of Ambedkarite and Buddhist Organisations, UK and Vice Chair, Anti Caste Discrimination Alliance, spoke of the growing culture of cow vigilantism as well as violence against the Dalits, Muslims and others under various pretext by the Hindu fundamentalists. She said that the government of India need to change its attitude and protect free speech, dissent and people’s choices to eat the food of their choice. She warned that we would continue to speak loud and take to street to show our concern and solidarity with all those victim of vicious violence by the Hindutva groups against Dalits and minorities. Speaker after speaker spoke against the cow vigilantism by the Hindutva organisations and asked the government to act against them. It was also mentioned that the NRIs living in the West in particularly must not support the hate mongering groups in India. The responsibility is more on the secular organisations to protect idea of India, its constitutional values and its minorities including Dalits and adivasis. It was definitely a positive development in long run that secular and organisations devoted to human rights and anti caste discrimination took to the street and showed their solidarity in the biggest western capital. The message was loud and clear that government of India must protect secular constitution of India and that the world is watching now and will be more watchful in future too of their actions. How to Revive the spirit of Quit India Movement ?